Food Circe, a start-up business set up in Rotherham to help people eat more healthily for less, enjoyed a taste of success after scooping the Sheffield Hallam University Enterprise award. Hallam history graduate James Barthorpe and his business partner Paul Simpson launched Food Circle in January 2018. It is based at RiDO's Century Business Centre in Manvers. Appalled at the quantity of good quality food and drink products that were routinely going to waste, James and Paul decided to create Food Circle, the first online UK-based retailer offering surplus "in-date" healthy food and drink products, to customers at half the recommended retail price. The Hallam Enterprise Awards take place every year, and provides an opportunity for Hallam student and graduate start-ups to showcase their businesses and share their achievements with an audience and judging panel of fellow entrepreneurs and innovators from the business and higher education communities. There was £10,000 of prize money up for grabs on the night, donated by Santander Universities (winner and runners-up awards) and QUICKPLAY (audience vote for the best business pitch). QUICKPLAY was co-founded by two Hallam graduates, Allen Holland and Will Parsons. As graduate recipients of the Enterprise Challenge Award back in 2006, they were keen to support the next generation of Hallam entrepreneurs. On winning the top prize of £5,000 to support the business, the Food Circle founders expressed their delight and thanked their supporters, including the customers and the brands they work with. In addition to the winner, there were two runners-up prizes: The Happiness Bootcamp, a social enterprise created by psychology student, Amiee Browes, which helps people combat their mental health issues through the power of physical exercise and Fula Flavour, created by Hawa Soh, a business and human resource management graduate. Fula Flavour has created a range of Djembe chilli sauces inspired by her culinary childhood experiences from her country of origin in Guinea, West Africa. The prize for the best pitch was awarded to computer science graduate and international break-dance specialist Torrell Euan. Torrell has combined his two passions to create Woosh! - an electronicjudging system that can be used for competitive break-dancing at all levels of competition. 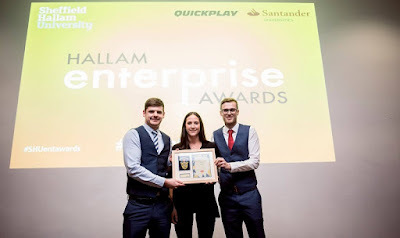 Caroline Nouvellon, manager of the enterprise team at Sheffield Hallam University, said: "This is the second Hallam Enterprise Awards we have hosted and it has already become the highlight in the enterprise team's calendar. "This awards event provides our talented students and graduates with an opportunity to showcase their businesses, entrepreneurial flair and professionalism. Their passion, drive and belief in their businesses combined with their resilience when meeting the challenges and set-backs they have all encountered, has made them worthy and deserving finalists. "I am confident that all of their ventures have the potential for success and sustainability in the years ahead."